Arsene Wenger knows that three points tonight will guarantee his side a place in the knock out stages of the Champions League. The game in the Ukraine will offer this Arsenal side a test. It won't be the walkover we saw at the Grove two weeks ago. Shakhtar on their own turf have been formidable this season. They have also never been beaten at home by an English team, with two wins and a draw. However I don't expect Wenger to play with caution tonight and play a strong team with the aim of winning the game. "I will remind the players that Shakhtar are a good side that we caught maybe on a good day. They will try to get revenge at home and we have a good opportunity to qualify to directly from the group. We want to take this chance. "If we take top spot you can ease off a little bit and of course treat the last two games with a more relaxed attitude. And sometimes that's good when you need to rest a player before a big League game. "But this game will demand a proper focus because Shakhtar are a good side with top quality." Wenger has travelled without his captain Cesc Fabregas who is nursing his hamstring. 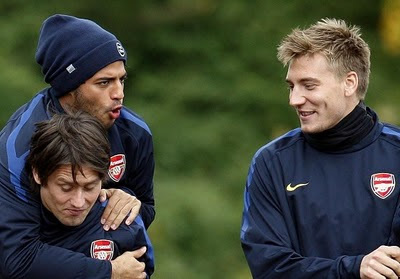 Also left in London are: Arshavin (virus), Song (calf), Denilson (groin) and Diaby (ankle). The manager has taken with him youngsters Craig Eastmond, Henri Lansbury and Jay Emmanuel Thomas. However I would expect just Eastmond to find himself in the starting 11. He''ll drop into the deep lying central midfield berth he occupied so effectively against Newcastle. Alongside him I think we all expect Jack Wilshere to drop into his usual deep lying central midfield role, with Song injured. As for the more attacking midfielder, I would expect Samir Nasri to drop back from the left hand berth and occupy Fabregas' role in dictating the play. As for the rest, I would hope that Tomas Rosicky would captain the side in Fabregas' absence. He played an excellent and disciplined game against Newcastle in the Carling Cup last week and found himself unlucky not to have dislodged Arshavin from the starting line up for the West Ham game. The discipline he showed playing alongside Denilson and Eastmond was one of the reasons we won the game. Tonight I imagine the Czech will be deployed on the left of the forward line. I think Theo will get his first since his injury on the start on the right. Up front Marouane Chamakh will lead the line, hoping to add to his six goals in his last six Champions League games. The defence and goalkeepers pick themselves and I don't expect there to be any changes from the back five who faced West Ham. I'll post the team line up when it's officially announced. Come on you Reds!!! !